Sitting atop a huge volcanic rock on the California coast, the Point Sur Lightstation has warned off boats for more than a century, looking like something out of a sailor’s dream the whole time. 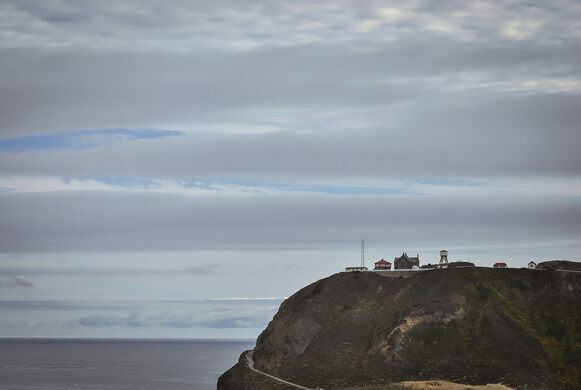 The Point Sur Lightstation sits 361-feet above the surf in Big Sur, California. The station was first proposed in the late 1800s after a ship dashed itself against Point Sur, and the local government decided that something had to be done. After receiving funding for the facility, the lighthouse first lit its light in 1889, after three years of construction. Initially, the tenders of the lighthouse lived atop the huge volcanic rock upon which the lighthouse was built. It was a fairly desolate existence due to the treacherous road leading to the top that kept visitors to a minimum. This problem became a null issue in 1972 however, when the Coast Guard automated the lightstation. Over its years in operation, the lighthouse had gone from using an oil lamp to a more modern Fresnel lens, but that too was eventually replaced by its current, modern spotlight. The old Fresnel lens is now held in the Museum of Monterey. Today the old lightstation is a protected historic landmark, and can be toured by the public. In fact it is the only totally complete turn-of-the-century lighthouse in California that is open to the public. Tours meet along the west side of Highway 1 at the farm gate, 19 miles south of Rio Road in Carmel, 1/4 mile north of the Pt. Sur Naval Facility.